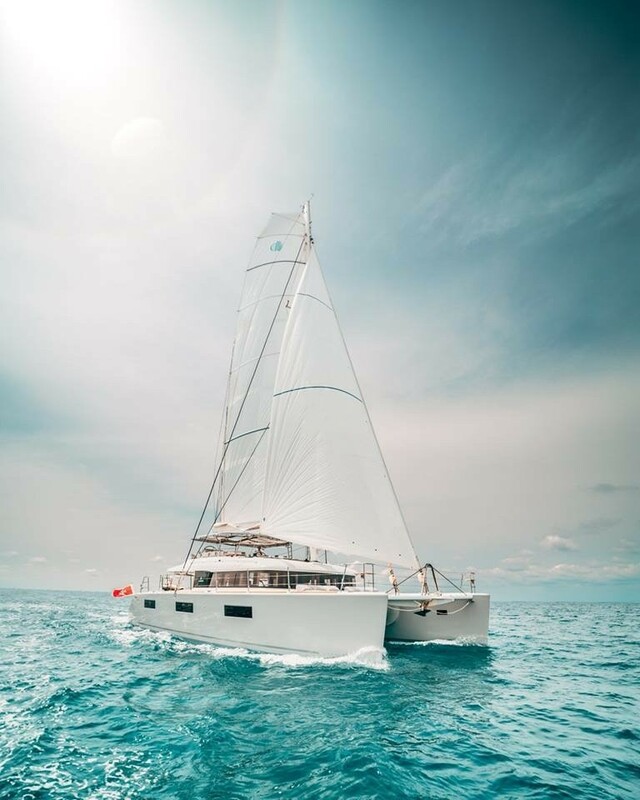 WINDOO is a striking, modern sailing catamaran, measuring 19.00 metres (62' 4”). She was built by Lagoon and launched in 2017, offering accommodation for up to eight charter guests in four cabins. There is a crew of three on board. The main deck cockpit is a sheltered environment fitted with a grill to port and a corner alfresco dining area and sunpad to starboard. A sofa lines the stern and the swim platform provides easy access in and out of the water. A port staircase leads to the flybridge, where the helm stations are placed along the stern and alfresco dining table with a sink-in sofa is placed amidships on the starboard side. The foredeck features two trampolines that can be used for sunbathing, and three sun pads are placed behind each for resting in the sunshine together. The hulls contain the guest and crew accommodation, with the port hull containing a forward double cabin, the crew accommodation amidships and a second double guest cabin to the aft. The starboard hull contains a forward double cabin and a Master cabin with a lounge that connects through to the aft en-suite bathroom and up onto the main deck aft. The main salon contains a port-side galley and an L-shaped sofa with two elevated tables to starboard, with the helm station forward and centre. While seated, guests can watch a film on the widescreen TV that rises out of the galley island table top when not in use. For light wind conditions, her twin Volvo D3-150HP produce a maximum speed of 10 knots and a cruising speed of 9 knots. Accommodation aboard WINDOO spreads over a four double-cabin layout.